When designing a custom home, it is important to have a clear idea of what you want. Before even going to see an architect, you should try a hand at creating a design for your home first and compile a list of features that you want. This will help ensure that you will end up with a home you are happy with. It is important that the architect you choose is willing to work with you and help make your vision a reality. If your architect is hard to work with or unprofessional in how they approach you, you should find a new architect before you’re too far into the process. 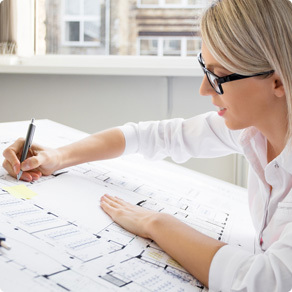 Always research potential architects ahead of time to ensure you are hiring someone who is licensed and reputable. Websites like the American Institute of Architects website is a good place to search through qualified architects in your area. Also, make sure to look at the website of the architectural design firm so you can look at the services they offer and a portfolio of their past projects. Don’t be afraid to ask lots of questions and find an architect whose personality works well with yours. Taking the time to find the ideal person to make your dreams come true will be worth the effort when the home you always imagined is yours.